NHS trusts are not doing enough to stop patients contracting a potentially fatal infection, watchdogs say. 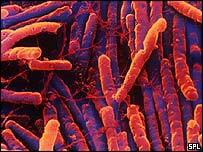 Clostridium difficile caused just under 1,000 deaths in 2003, figures for England show. The Health Protection Agency and the Healthcare Commission found a third of the English trusts surveyed do not routinely follow official guidelines. Key measures to reduce risk include careful use of antibiotics and being able to isolate infected patients. The organisations' full report is set to be published in the spring. But interim results have been released now, prior to the peak time for C.difficile infections. C.difficile is a common hospital-acquired infection which usually causes diarrhoea but can lead to fevers or more serious infections. The first set of data from a mandatory reporting scheme last year showed there had been over 44,000 cases of the infection in hospitals in England. The Healthcare Commission and the Health Protection Agency surveyed directors of infection prevention and control at 118 of the 173 trusts in England. Most directors felt the incidence of C.difficile was rising. However 38% did not have restrictions on the use of antibiotics. The Healthcare Commission's Marcia Fry, who headed the survey, told BBC Radio 4's Today programme that the overuse of antibiotics was a major problem. "What they [antibiotics] do is destroy the good bacteria in the gut and allow the infection with the C.difficile to take hold. "You want more targeted antibiotics to the specific problem being treated - but to get control of antibiotic prescription across a trust or across a community is not an easy thing to do." In addition, over a third of the trusts surveyed said they could not isolate patients routinely, and only 11% of trusts have a ward that can be used for isolating patients with C.difficile. The survey even found that hospitals do not agree on what constitutes an outbreak. And many said their trusts did not follow guidelines on who should be informed when they did have an outbreak. Sixty-five per cent admitted their trusts do not routinely record information on deaths from C.difficile. Nigel Edwards, policy director of the NHS confederation representing NHS trusts, said trusts had been put under "very high pressure" by a "very large push" to take care of other priorities. "If you're short of facilities and you're really anxious to get your elective surgery patients in and your cancer patients in, some trade-offs may be being made there," he told Today. This made implementation of guidance "difficult in particular circumstances", he added. The HPA and the commission recommend trusts adhere to "best practice" guidelines on antibiotic prescribing, review their ability to isolate patients and to ensure they comply with the requirement to report all C.difficile infections in over 65s. Professor Peter Borriello, director of the Centre for Infections at the Health Protection Agency, added: "The results of this survey will help us to improve our surveillance of C. difficile and learn more about how trusts treat patients and tackle outbreaks." Health Minister, Jane Kennedy, said the NHS system of C.difficile surveillance was "now the most advanced in the world". But she accepted some trusts still had work to do. "The new Hygiene Code currently undergoing scrutiny in Parliament will make it a statutory duty for trusts to have all these systems in place; and the Healthcare Commission will have the power to issue improvement notices if hospitals are failing to carry out these measures." Ms Kennedy added that the Chief Medical Officer had written a "firm reminder" to all trusts, reminding them of the steps they should be taking to minimise the risk of C. difficile. Steve Webb, Liberal Democrat health spokesman, said the government was "guilty of gross complacency on this issue and should sit up and take notice of their own inspectors". C. difficile hit the headlines in June after it emerged that more than 300 patients at Stoke Mandeville Hospital, in Buckinghamshire, had contracted the infection and 12 elderly patients had died after contracting it since 2003. Have you, or anyone you know, been affected by the C.difficile bug? My elderly Mother died in march this year in a hospital ward of Clostridium difficile. She was feeling fine & ready to come home on the Friday but deteriorated rapidly and died the following Thursday. C.difficile was not recorded on her death certificate. Our Family made a complaint about the hygiene which contributed to her circumstances & received an apology. My father contracted C. Difficile in May and it took 9 weeks to heal. He went from 14 to 9 stone, then he also contracted MRSA and died of this in September in Hospital. If risk of infection is too high, surgery should not be attempted. Patients should be isolated from visitors and other patients if vulnerable. Broad spectrum antibiotics should only be used for very healthy patients. My mother was killed by Clostridium difficile, on 4th August, 1996, in Hospital. She was 80 years old and suffered from Rheumatoid Arthritis. Somebody, somewhere didn't wash their hands properly. She fought the bug but eventually just had to abandon the struggle. Mrs. L. M. Smith, London, England. One of my friends contracted this whilst in a Somerset hospital. He was seriously ill for several months. His wife was heavily pregnant at the time and wasn't allowed into contact with him. He suffered mentally as well as physically as a result, and still hasn't fully recovered. My father contracted C-Difficile and MRSA whilst in hospital in Cambridge. He was in the hospital for too long before an operation and was therefore 'left open' to any infections abounding in the wards. My poor dear father died on 9th October 2005. The Death Certificate states Bronchial Pneumonia - but I know what really killed him! We, as a family, have been left devastated - it would have been mum's and dad's 60th wedding anniversary yesterday (20th December). I have never had C. difficile but a number of my patients have had (I'm a GP). This is one of a number of reasons GPs try very hard to let people know that for the vast majority of respiratory problems antibiotics are best avoided. People need to know that antibiotics can have dangerous side effects and should not be used without weighing up the pros and cons in any given situation. My 88 year old aunt contracted C. difficile. They made my 80 year old mum take home the soiled clothes to wash without telling her to be careful. Also the only washing aid for visitors was alcohol based which does not kill the bug. I am appalled at the way she was discharged, still on antibiotics and still having diarrhoea. She now has numb feet and is totally housebound.